Yes the field is definitely changing. Codex M (021), Codex Campianus, is a Greek Gospels-manuscript, assigned to the 800’s. It is one of the uncial manuscripts described by Metzger in Text of the New Testament, although he only spared four lines for it (see page 54, third edition). It is probably less than 100 years younger than Codex L. It is housed in the Royal Library at Paris, Cat. Grec. 48. 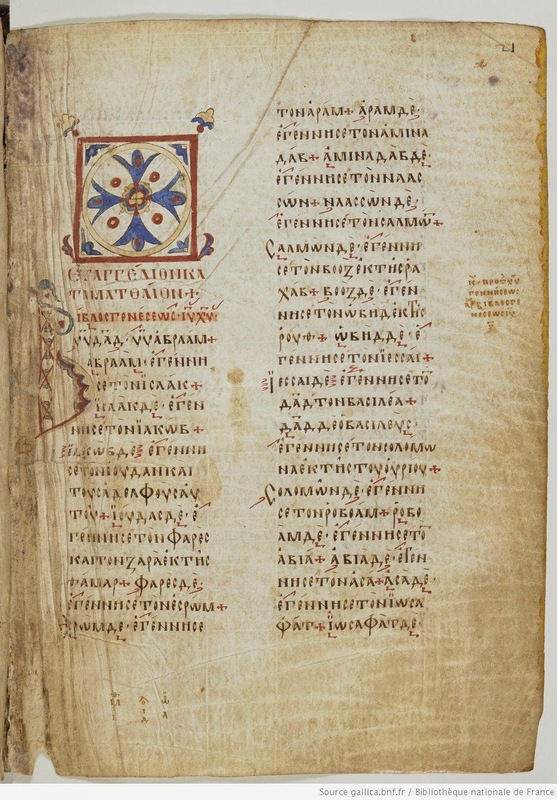 Codex M contains a Greek Synaxarion – one of the earliest extant. It also features Eusebius’ letter to Carpian about how to use the Eusebian Canon-tables, the Canon-tables themselves, and an extract from a composition by Hippolytus of Thebes, [also in MS 714] summarizing major events of the Gospels in chronological order and also presenting the background of Jesus’ extended family. Throughout the manuscript, the margins contain Anagnosmata, or reading-notes for lectors, stating where to begin to read the lections, and with what incipits, or opening phrases. They are frequently accompanied by a single asterisk (except where the asterisk has been lost via overtrimming), with another asterisk appearing in the text at the beginning of the lection – above the beginning; it does not look as if the copyist of the text left space for arch- and telos-marks. Neumes have been added, too. Codex M is also equipped with chapter-headings (some of which have been trimmed away) at the top of the pages, and a foot-harmony at the bottom of many of the pages. (This list shows the chapter-and-verse of the first line of the first page of every fifth image. 3 – Identification-page: Grec. 48. 4 – Brief description of the contents. 5 – Notes and description, in French, blurred. 7 – Dark image – Menologium (?). Two columns of text. Headpiece in first column. Circle within a square. 9 – Synaxarion. Note on left side, apparently about the reading for Ascension-day (Mk. 16:9-20). 15 – end of Synaxarion. Ad Carpianus, with curved arch. No picture or title is in the arch. 16 – Ad Carpianus, continued. 17 – End of Ad Carpianus. Beginning of Canon-tables. 23 – Canon-table 10 and Kephalaia for Matthew. 24 – More Kephalaia for Matthew. 25 – From Hippolytus’ Chronicle in his Teaching-Books (“Didaskalia”). The author is not the writer of the early 200’s, but Hippolytus of Thebes, who wrote in the 600’s or 700’s. 27 – The rest of the Chronicle of Hippolytus of Thebes. Matthew 1:1 begins on the second page, below a square-and-circle headpiece (all decoration; the title is written below it.) There is a foot-index. 61 – Mt. 15:36. Verses 2-3 of ch. 16 are in the text. A cross (like “+”) is right next to the end of 16:1 and the same symbol is also right next to the end of verse 3. “Υποκριται” is in the text of 16:3. Alongside Mt. 26:20 at the beginning of the second page, a lectionary-related note instructs the lector to jump to John chapter (i.e., section) 114, [13:3] – ειδως δε ο Ις οτι πα[ντα]. 93 – Mt. 28:7. last page of Matthew. 95 – Kephalaia for Mark, and the first page of Mark. 137 – Mk. 16:15, to the end of Mark 16:20. (“And in their hands” has been added in the left outer margin to 16:18.) First page of Luke. Luke 1:1 is below the title, which is below a square-and-circle decoration. That is great, very helpful. A quindex eh? 173 – Extremely poor image. 174 – Extremely poor image. Last lines on the second page conclude in Section 133 (Lk. 11:33). 175 – Illegible except for a lectionary-related note and section-number in the margin. 200 – Lk. 21:26. On the first page, there is a large “+” mark and a “υπ” (“Jump”) abbreviation, accompanied by a obelus (division-symbol), alongside the beginning of Lk. 21:33 (i.e., the end of Lk. 21:32.) A thick vertical line separates the end of Lk. 21:32 and the start of 21:33. Another obelus is above the start of 21:33. 202 – Lk. 22:27. Lk. 22:43-44 are at the end of the fourth column. “Τελος,” written in full, follows 22:42, and abbreviated instructions to jump are on both sides of the text. 210 – Lk. 24:46. Last page of Luke. Kephalaia for John: 19 chapters. Chapter 10 = about the adulteress. 212 - John 1:1. Text begins below the title. The title is below a somewhat crudely drawn decoration. 221 – Jn. 4:44. John 5:4 is in the text. A cross (like “+”) appears at the end of John 5:3, and another cross appears in the text between the end of 5:4 and the beginning of 5:5, in the middle of a line of text. Another cross is present at the end of 5:5. Codex M reads και οκτω in 5:5. 231 – Jn. 7:51. John 7:53-8:11 is included. The lectionary-related marginalia instructs the lector to jump from the end of 7:52 to the beginning of 8:12; asterisks are used to show where to jump, and where to resume reading. 264 – Jn. 21:23. Last page of John; John ends in the first column. An Arabic note occupies much of the second column. The second page is blank. The Date of Majuscule 0305 - Suggestions?